You don’t have to pedal across America, or fly-off to New Zealand, or even be an Adventure Racer to enjoy the benefits of great-tasting No Opportunity Wasted® Energy Bars. 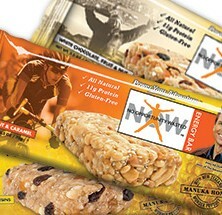 Whether you are a seriously active athlete looking for a great performance tool, a weekend warrior looking for an edge, or even a health-conscious individual looking for a nutritious snack, No Opportunity Wasted® Energy Bars were developed with All-Natural ingredients, and have an ideal 4:1 carb to protein ratio to fuel and maintain energy levels during any endurance activity. 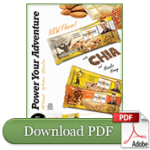 Unlike your average energy bar, No Opportunity Wasted® bars contain WHITE CHIA SEEDS which provide healthy EFA’s but can also help regulate electrolytes, and are the only US marketed bar made with New Zealand’s potent MANUKA HONEY which helps boost the immune system with its inherent antibacterial properties. 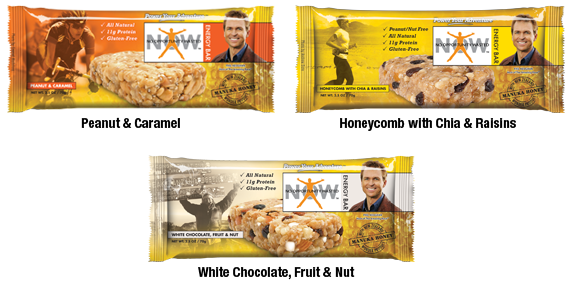 No Opportunity Wasted ®Energy Bars are moist, won’t melt and tasty to the core. There is no need to try and chew down some grainy dry energy bar anymore. 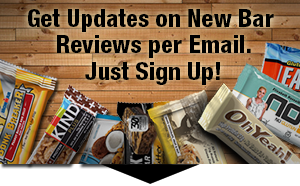 One taste of a No Opportunity Wasted ®Energy Bar and you will see why there is no comparison. INGREDIENTS: Whole Grain Gluten-Free Oats, Peanuts, Brown Rice Syrup, Soy Crisps (Soy Protein Isolate, Tapioca Starch, Salt), Organic Tapioca Syrup, Caramel Flavored Bits (Invert Sugar, Sugar, Concentrated Apple Puree, Vegetable Glycerine, Cellulose Powder, Fructose, Pectin, Caramelized Sugar, Palm Oil (Sustainably Sourced), Natural Flavors, Natural Caramel Color, Titanium Dioxide and Annato for color, Lactic Acid), Corn Flakes (Corn Meal, Long Grain White Rice, Evaporated Cane Sugar, Sea Salt), Manuka Honey, Vegetable Glycerine, White Chia Seeds, Peanut Flour, Gum Arabic, Rice Syrup Solids, Rice Bran Oil, Sea Salt, Natural Peanut Extract, Soy Lecithin, Natural Flavor. ALLERGENS: Contains Peanuts and Soy. 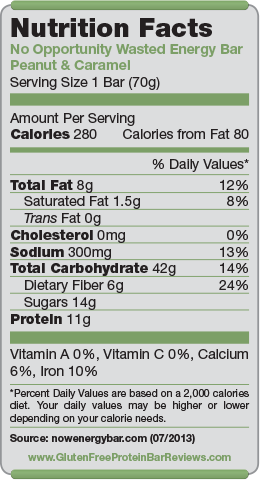 Nutrition facts based on Peanut & Caramel flavor. Facts and ingredients vary by flavor. For adventure TV personality Phil Keoghan, “energy” is something that you can never fall short on when you live every day of your life to the fullest. Actually, one may say that by looking at Phil’s globetrotting endeavors over these past twenty years that he’s somewhat an authority on “energy,” or the need for it. Nutritionally speaking, a demanding schedule like Phil’s can also provide its share of pitfalls. That’s why Phil turned to the leading authority in Sport’s Nutrition Product Development, Shubox Inc. to develop what they are collectively considering The World’s Best Energy Bar – The No Opportunity Wasted® (NOW) Energy Bar – an All-Natural, Great Tasting, Gluten-Free Nutrition Bar.